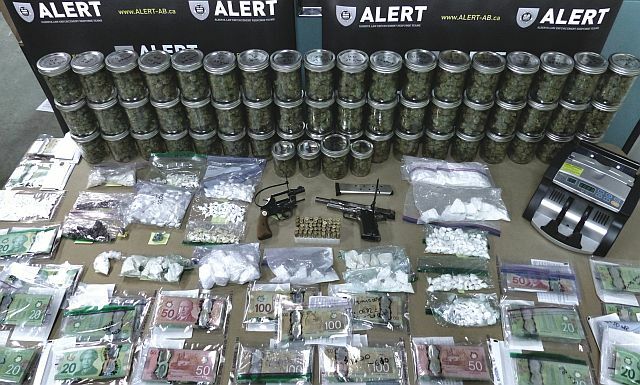 Photo evidence of the illegal substances, money and firearms found in the series of Alberta Law Enforcement Response Team raids. Grande Prairie… Four people associated to an organized crime group known as the Surrey Boys have been arrested following a series of ALERT raids in Grande Prairie. A significant amount of drugs and cash were seized, along with two handguns. Nearly a quarter million dollars’ worth of drugs and cash proceeds of crime was seized as the result of search warrants being executed on January 21. Three Grande Prairie residences were searched with the assistance of RCMP Grande Prairie. Check a video on YouTube with Inspector Chad Coles on the Grande Prairie drug arrests. It is found at https://youtu.be/e2KClfl1GUs. “This demonstrates ALERT’s ability to target gang-related activity in communities across the province and it has a significant public safety impact,” said Insp. Chad Coles. $55,415 in cash proceeds of crime. The drugs seized have an estimated street value of $183,290. Cash and three vehicles were seized as offence related property and will be submitted to the province’s civil forfeiture office. One of the handguns was a loaded, prohibited revolver, while the other handgun was previously reported stolen out of Burnaby in 2004. Four people were arrested all have strong ties to Surrey, B.C. and are allegedly involved in Grande Prairie drug trafficking operations under the name Surrey Boys. ALERT believes they are connected to a larger organized crime group operating in the lower mainland area. ALERT began their investigation into the Surrey Boys in November 2015. ALERT will continue the investigation and be in liaison with policing partners in B.C.